It’s a question we get asked daily. There are A LOT of options for in-tank pumps on the market today so we decided to have 22 of the most popular in-tank pumps out there tested and see how they stack up against each other. In this article we will help you understand the data in a way that will help you pick the right fuel pump for your build. The test was fairly simple. We had them run each pump through the same test, with the same variables held constant. We had them flowed at the same voltage, with the same fluid, on the same instrument. We tested them separately at 13.2V, as well as at 16V to see how much more they could flow with a voltage booster. You might be wondering “But don’t the manufacturers already release each pump’s flow numbers? Why not just compare those?” Well if you look very closely at each manufacturer’s advertised flow ratings, you will notice some inconsistencies that make it difficult to compare their stats fairly. For example, if each of their flow tests were run at different voltages, or used different fluids, it would make their results difficult to compare fairly. But also, knowing how a pump performs at 40psi does not necessarily tell you much about how it’s going to run at 70psi. For example, some manufacturers advertise fuel flow numbers at a voltage reading taken at the fuel pump terminal instead of advertising it as the flow at the supplied voltage from the power supply. This can complicate things even further because then 13.5V from one manufacturer might not be the same as 13.5V from another manufacturer. It seems that every manufacturer has their own way of doing it. It is reasons like these that make this test so important and necessary. These pumps need to be tested back to back under the same conditions to see how they perform against eachother in a fair apples to apples comparison. From there you can move all of the numbers collectively up or down by adjusting the test voltage or pressure. After learning what we did from this test, we then decided to publish these results for free, for the benefit of the community. The reason we are going to spend some time understanding the concepts before jumping to the answer is because over time as this article becomes older and older, the actual highest flowing pump on the market will change as technology advances, however the concepts behind them will remain the same. So understanding the concepts will help you more than us JUST telling you whatever the highest flowing pump on the market was in 2018. One thing to remember here with fuel pumps before we go any farther in the discussion is, as fuel pressure goes up, fuel pump flow goes down. And increased fuel flow is necessary to increase horsepower. So concept number one is that “pumps flow less as you increase fuel pressure”. However, they don’t all “fall off” the same way as pressure increases. Some of them fall off more than others as pressure increases.. Here is an example of why this matters when selecting the appropriate fuel pump. Most of us run a base fuel pressure of 40psi. And many of us with turbocharged or supercharged applications use boost-referencing fuel pressure regulators that raise the fuel pressure as boost increases. Let’s say someone with a turbocharged engine running 40psi of base fuel pressure, and 30psi of boost from their turbocharger (adding them together) gets up to a maximum fuel pressure of 70psi throughout a race. Comparing various pumps’ performance at 40psi of fuel pressure may not be an accurate indicator of which one performs best at 70psi of fuel pressure. More clearly stated, the pump that flows the highest at 40psi of fuel pressure may not be the one that flows the highest at 70psi of fuel pressure. So comparing pumps with an advertised flow rating at 40psi of fuel pressure may not be the best way to select the right pump for your build. I told you that, to tell you this. When someone says “this fuel pump flows more than that fuel pump”, your first question should be “where?”. Or more accurately, “at what pressure?”. It’s important for you to remember that you should be comparing them at the maximum fuel pressure that will be used at for that setup. If you will be running 30psi of boost on top of 40psi of base fuel pressure, then compare pump flow rates at 70psi. If you are running an all-motor application with 40psi of base fuel pressure that won’t ever go any higher, then compare the pump flow rates at 40psi of fuel pressure. Pressure is not the only thing that affects the pump’s flow however. The amount of voltage you power it with from your car’s electrical system will influence how much the pump flows as well. Usually most pumps flow more when you increase the voltage applied to them. That is why companies like Kenne Bell and JMS make adjustable fuel pump voltage amplifiers that allow you to increase the amount of voltage powering the pump higher than the vehicle’s existing electrical system normally could. However the follow-up test results showed unexpected behavior between some of the different pumps as we started using a voltage booster to apply more voltage. They did not all react with the same performance to the same voltage increase, and some actually saw a drop in performance when applied to higher voltages. We will speculate a conclusion from those reasons later in this article. The easiest way to visually illustrate the results from this test is with a line graph plotting the fuel flow at various pressures. 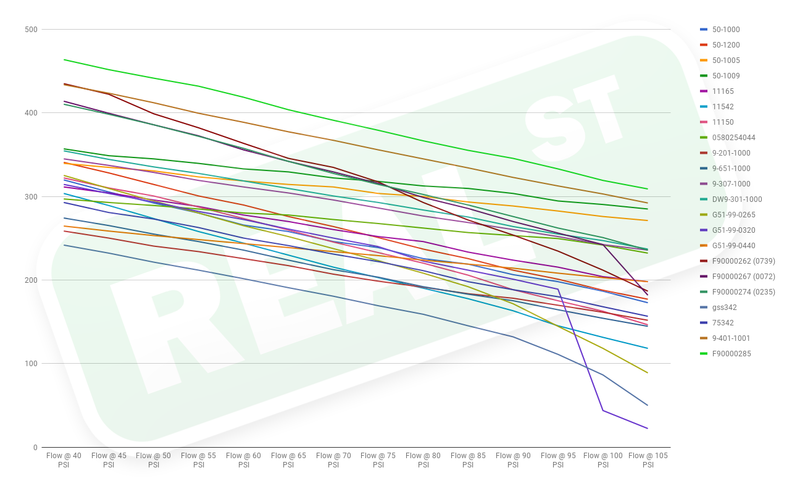 Each line on this graph represents a separate fuel pump’s performance across various pressures. Each point on each line is a separate flow test at a different pressure. When looking at the bottom horizontal (x) axis, you will see this represents increasing fuel pressure from left to right in “PSI”. When looking at the vertical (y) axis on the left you will see increasing fuel flow in “Liters Per Hour” from bottom to top. Each colored line is a different pump. When you see a line take a SHARP turn down, that is when the pump’s “Pressure Relief Valve” opened. That means that is the maximum pressure the pump is designed to withstand. The first thing to notice is that all of the lines trend down as they go from left to right. This is consistent with what we learned earlier about fuel pump flow decreasing as fuel pressure increases. The second thing to notice is that some of the pumps that flow more than others on the left side of the graph (low pressure) actually flow less than those same others on the right side of the graph (high pressure). This supports our earlier statement that “not all pumps react to pressure the same way” some of these pumps that perform great at low pressure should just not be used in higher pressure applications. It’s clear to see that the top pump out-performs all of the others at every pressure reading. It is the highest flowing in-tank pump of the group. period. Let’s take a closer look at the top 2nd and 3rd pumps down from the top at 40psi of fuel pressure (the left side of the graph). These two pumps are performing almost identically at 40-45psi of fuel pressure. One is at 435lph and the other is at 434lph. So for someone who will not be utilizing a fuel pressure higher than 40psi, these two pumps can be expected to perform similarly. However, those same 2 pumps are pretty far apart from each other at 70psi of fuel pressure (334.8 lph vs 367.2 lph), and even further apart at 90psi of fuel pressure (253.8 lph vs 322.8 lph). So, just comparing these 2 pumps, you can see one of them falls off pretty drastically as fuel pressure increases, while the other one maintains flow better at higher fuel pressure. That means, while a high horsepower naturally aspirated setup would be fine with either of the top 2 pumps, someone running a boosted setup would be much better off going with the pump that holds flow better at higher fuel pressures. If you haven’t noticed yet, we have avoided paying attention to who the manufacturers were or what the pumps were advertised to be rated for. This is an intentional step in our methodical interpeting of the test results, to avoid contamination from any potential preconceived bias that may sneak in from personal preference. We want the results to speak for themselves. The results show that a lot of the pumps behave similarly, while some of them obviously outperform the majority of the others. 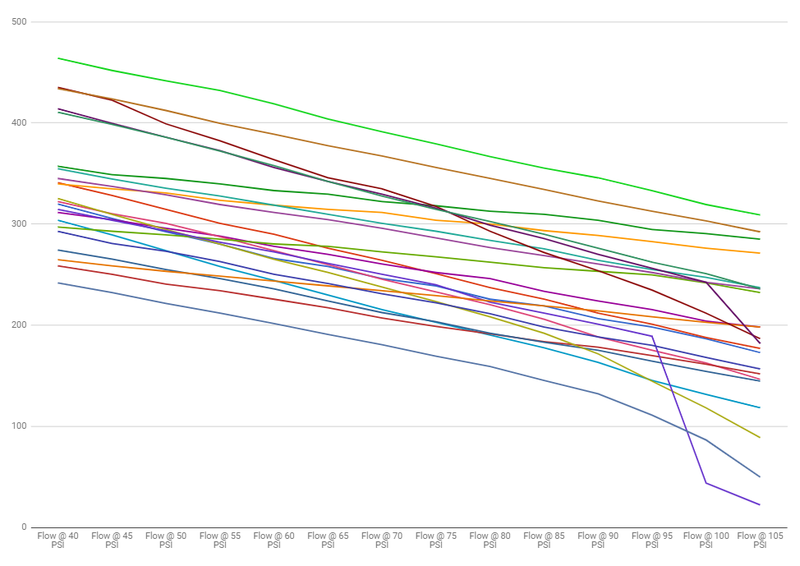 Here is the same Graph with the part numbers listed. But does everyone need the highest flowing pump on the market? Of course not. If your goal is 300hp, then you need a big enough fuel pump to provide you with 300hp worth of whatever fuel you are using. And using a higher flowing fuel pump than that will not improve your result. So let’s look at what these numbers mean in terms of horsepower. So at this point you are probably looking at this chart thinking “Ok so, i know which pumps flow more than others, but how do I know which pump is right for me?” It will be easier to read if we convert fuel flow into Horsepower capabilty. There are many ways to do this, some more complicated than others, but all of them are an estimation. Since we are making a guess, for the sake of simplicity, I am going to use an overly simplified calculation that was taught to me as a quicky shortcut by Paul Yaw of Injector Dynamics. To get a ball park guess of HP on gasoline, we will triple the LPH number, and for power on E85 we will double the LPH number. This method will get you close, but feel free to plug these LPH numbers into a more elaborate calculator on your own for a number that will be a better guess for your specific application. So here is how you can use these charts to help you pick a fuel pump for your setup. Start in the chart for the fuel you will be using. Then find what your maximum fuel pressure is going to be. Typically most people start with around 40psi of base fuel pressure. If you are running forced induction and you are running 30psi of boost, then you add that on top of your base fuel pressure to get 70psi. 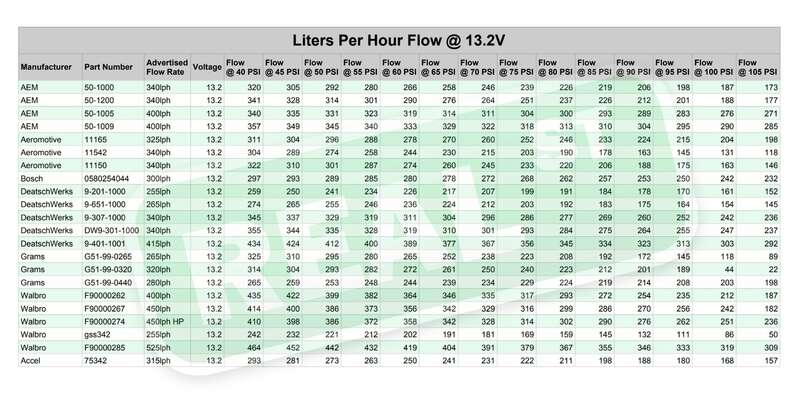 So go to the 70psi column on the chart, and start comparing the power capacity differences between the flow numbers in that column. You’ll probably notice that there are pumps in that column that flow more than what you’ll need, and there are ones that will flow less. Also remember many of the vehicles we modify have options for twin or triple pump hangers, so you can run more than one of the pump you select. So the next time you hear someone comparing fuel pumps, listen closely to see if they are comparing the pumps at a specific fuel pressure, and if the fuel pressure they are comparing at is the fuel pressure they will be racing at. Compare pumps in the column you will be using them in. We are the official European distributor for Deatschwerks, if you would like to know more or receive a catalogue please get in touch.